Home Off Beat	Eye tattooing: Dare to be different! Imagine people with blue sclera, green ones, red ones… Yes this is possible! 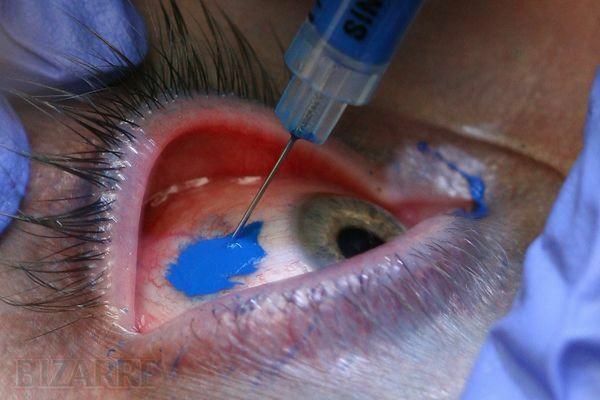 Sounds insane but people are getting their eyes tattooed. Tattoos have gone too far. You must have seen many people using tattoos as eyeliners, eyebrows and eye shadows but the latest trend in permanent ink is eye tatt. People really are getting their peepers tattooed in more or less the same way that you would get any other part of your body inked. To me it sounds painful… but if you are the one who wishes to get the eye tatt, I wish you good luck! ← How about inking your palm?